GMT engineers and builds custom carbon composite parts for a huge range of applications. From robotic parts, to precise machined parts used in manufacturing, carbon composites allow us to build lightweight yet very stiff parts to extremely accurate tolerances. Carbon composite parts have minimal deflection due to the dimensional stability of carbon through a wide range of temperatures and humidity, making them well suited for a variety of manufacturing processes and environments. Strong lightweight carbon parts can offer a number of benefits; by replacing heavy steel rollers on a paper cutting machine with carbon rollers, GMT was able to lower the inertia involved, allowing the machine to cut shorter pieces at a more rapid rate. GMT has a proven track record of repeat customers such as Lam Research, KLA Tencor, and Brooks Automation, and our custom carbon parts have helped improve the bottom line in many ways. We welcome the opportunity to discuss how our engineering and use of carbon fiber may prove to be an excellent solution for you. The effectors at the end of a robotic arm have to be light so that the arm can be accelerated quickly, and stiff so they do not vibrate or hit parts being produced. Effectors made from carbon/epoxy can often be used to upgrade a robotic production system. The composite parts allow the unit to operate at higher throughputs, reducing production costs. The carbon robotic end effectors shown here feature channels and perfect tip alignment for fiber optic cables and sensors. These carbon parts used in silicone wafer production require a tolerance down to .0002" or .005mm. 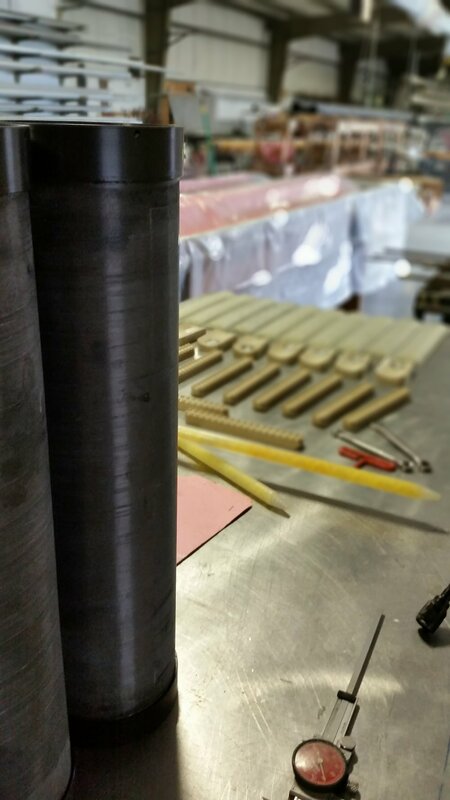 The finished product goes through a rigorous inspection process to ensure that every unit is identical and meets the highest standards, a clear example of GMT's ability to produce extremely precise custom carbon parts on a large production scale. GMT welcomes orders in quantities as small as a single unit, so we are always receptive and a good resource for building prototypes. To maintain confidentiality, which is usually an essential in prototyping, we do not identify our prototype clients or their projects, but can state that these range from processing equipment and medical devices to competitive sports equipment as well as military components and field gear. Our engineering competence, manufacturing skill, and quality assurance with carbon composites are key factors in support of your decision to bring prototyping projects to us for further discussion and quotation. GMT works with a number of customers to provide custom CNC machined parts. Whether milling foam or carbon, GMT has been utilizing CNC machines since 1984 when we first started designing and building carbon sailboat rudders for use in the America's Cup.